This is a modification to an earlier tip I wrote, whereas this code will only record delete changes, my earlier article will record delete and update changes to the data. I found code online by Brett Kaiser and I modified it for my purposes, with a mind to other Access developers I made some changes which I will explain here. 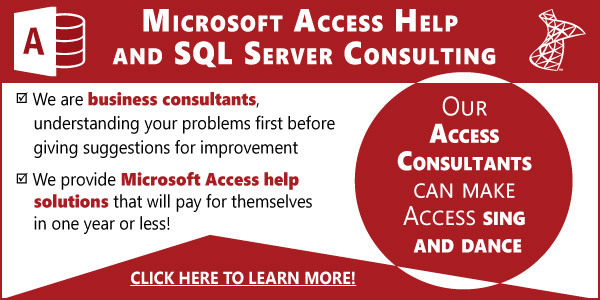 Note: This article assumes you’re familiar with SQL Server tools and TSQL. — Now replace the code above with the code below in the query window. You can either type the table names into the new tblAudit table or you can use the following code which will insert a record for each table in the database. CAUTION: Don’t add triggers to a table unless they are mission critical, some tables you may not want to add triggers for our look up tables or tables where not everyone has access too. If you do use the code below to populate the tblAudit table then STOP and review the list of tables and delete any unncessary tables you don’t wish to track. — Now Lets create the audit TRIGGERS. Note: I’ve modified the original code so that it will not record changes to the Timestamp field and code that will encapsulate the word DEFAULT correctly when it’s encountered in the table. I also don’t wish to save the domain name along with the username in the table, so I’ve added code for that as well.